Lawyers should definitely regard outside vendors as natural allies in shaping a firm's business and economic success. Unfortunately, in the law firm world, vendors are too often perceived merely as technicians who typically do not get to sit at the table with the buyers – the lawyers who own the firm – because the buyers perceive themselves to be in a senior position. It follows that if vendors want to be valued, they must show that they are worth being taken seriously. That means going well beyond the level of merely satisfying their buyers... the lawyer/owners. Satisfaction is the minimum threshold of a professional services relationship. Vendors who don't communicate with their clients to learn what those clients want, now and in the future, will have dissatisfied clients who do not respect them. This communication process is a collaboration that bases a client/customer relationship built on loyalty. The vendor who offers and promotes new ideas or trends in the industry before they are released to the general public is offering performance to the law firm. It's a collaborative process that goes both ways and benefits both sides. Consider three examples of how the process can work. Document Storage. Lawyers must maintain and safeguard client documents and files almost indefinitely, creating a huge storage dilemma. Some leased photocopy machines scan documents without charge if paper is not used to print the image. An equipment vendor could offer lease terms that say only copying and not scanning is to be charged. The scanned documents are then stored on electronically searchable disks. The result: storage costs are lower, documents can be found more quickly, and equipment vendor has a satisfied client. Insurance. Lawyers must protect and preserve client property and files require precautions against the likelihood of harm to those materials. A proactive insurance agent should be asking its law firm client for a complete inventory of client property, then assessing its value in order to effectively insure it. Specialized coverage for earthquakes, floods, hurricanes, as well as business interruption and technology disasters, should be part of the mix. Coming to agreement on these issues can prevent much grief for lawyers and their insurers alike. Technology. 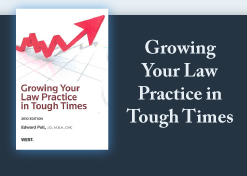 Many small law firms resist buying or updating technology because they are overwhelmed by the high up-front expense. Recognizing this, technology business partners can offer leasing programs that feature more frequent upgrades and also have tax advantages. A leasing agreement can be structured to allow the firm to trade in old leased equipment at the end of the term for new equipment, and a vendor can make the process especially attractive by including software and/or implementation services. Such arrangements take time to negotiate, but, again, both sides benefit. If your firm's vendors are not taking such initiatives, it's time to ask them – or get new vendors. I'm back, having returned from three weeks journey through California and Oregon. Went to the internationally famous Ashland Shakespeare Festival, 75th anniversary (on the date of watching Twelfth Night), driving through the redwood forests (the largest living things on earth), and driving south along the Coast... magnificent scenery, all! Good to be home - and now needing a vacation from our vacation! Save the date: September 21st - The West Thomson Reuter Second Annual Midwest Law Practice Management Conference, to be held in Chicago at the Chicago Bar Association offices. Our day long symposium will feature Alternative fees; Lateral movements; Succession planning; and Marketing/Business Development practices. More information will follow.